A popular public library moves into new premises. 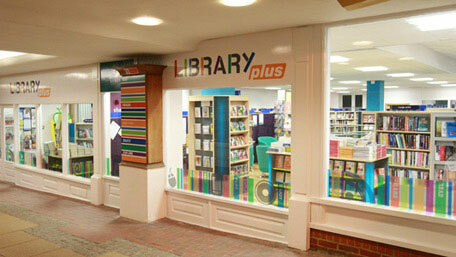 Dorking Library was relocated to a precinct area to occupy what was formerly three separate retail units. The location, accommodation and budget meant that the design needed to be fresh and inviting while incorporating the client's branding. The retail position meant that bookshop and library styling needed to combine to broaden the appeal from the pavement. Here, external signage ties in with the bright airy feel of the interior. The all wood effect shelving was fitted with lit panels to accentuate specific areas. Contemporary colour schemes were applied to draw attention from various perspectives. Shelving was positioned to define areas, with each area being given design treatment to suit designated space. The bright feature wall in the children's area is complemented with dynamic lighting, brightly coloured furniture and bespoke kinder boxes.